To build the university where Bill Clinton will speak this week, laborers are paid less than what was contracted, are refused their own passports and bank cards and sleep a dozen to a room. Last month, NYU Abu Dhabi announced in a press release that its lavish, state-of-the-art, 450,000 m2 campus on Saadiyat Island had finished construction. Yet as the New York Times reported yesterday, the human costs were immense, and possibly unprecedented for an academic institution. The Times’s Ariel Kaminer investigated the labor conditions at NYU Abu Dhabi and found physical abuse, illegal recruitment fees, withheld passports, squalid living conditions and debilitating pay droughts, with minimal oversight from the university. This isn’t the first time we’ve heard about labor abuses at NYU-AD. 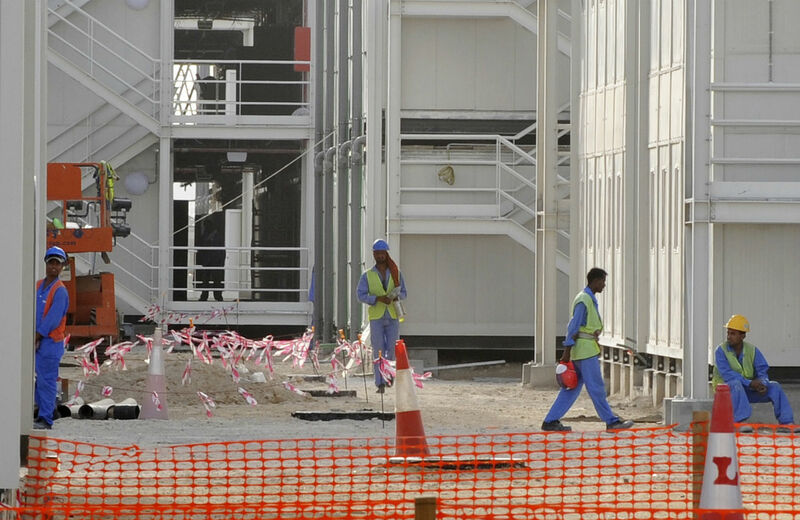 The Guardian’s report on migrant workers is a stunning indictment of the system of labor in Abu Dhabi, where satellite versions of the Guggenheim and Louvre museums are currently under construction on Saadiyat Island. Yet this newest article, in focusing on NYU’s explicit role in labor exploitation, takes the university to task. To build the university where Bill Clinton will speak this week, laborers are paid less than what was contracted, are refused their own passports and bank cards, and sleep a dozen to a room. When attempting a strike, workers were arrested and beaten by the police. This is par for the course in Abu Dhabi—strikes are illegal and brutally suppressed—but it is a stunning contrast with NYU-AD’s commitment to academic freedom and university core values. When the worker’s complaints were relayed to them, university officials stated that they were unable to verify the complaints either way, as the laborers are not employed by NYU—rather by contractors, in turn working for the UAE government. Margaret Bavuso, the executive director of campus operations for NYU Abu Dhabi, said that the university doesn’t monitor the wages paid by the construction companies at all. The cornerstone of John Sexton’s Global Network University, NYU Abu Dhabi’s “walled garden” is luxurious for students and faculty. The campus was financed by the Abu Dhabi royal family, and all expenses are paid. The university compensates tuition, room, board, food, and even travel. Yet despite star professors and a Rhodes Scholar, the grim realities of the institution’s genesis have crept over the garden gate. Outside of NYU-AD’s ivory tower, academic freedom and human rights are routinely abused. Human Rights Watch published a disturbing report from the UAE, illustrating the social and gender inequalities systemic in the country. The Times found otherwise: With NYU’s new campus now complete, many workers have found themselves unemployed and stuck in financial limbo. Almost all of the workers interviewed said that they were forced to pay huge recruitment fees for which they’ve never been reimbursed. Two Nepali workers, Ramkumar Rai and Tibendra Kota, completed their work in 2013 but are unable to leave the Emirates. They recount spending the last sixteen unpaid months with expired work visas, unable to pay off debts and unable to afford flight tickets home. This week, the Coalition for Fair Labor at NYU launched a campaign urging NYU-AD to overhaul its human rights practices and labor standards. A petition letter with over 200 signatures from students and faculty from both NYU New York and NYU Abu Dhabi was sent to John Sexton and several members of the board of trustees Friday morning. The occurrences cited in today’s New York Times are, if true as reported, troubling and unacceptable. They are out-of-line with the labor standards we deliberately set for those constructing the ‘turn-key’ campus being built for us on Saadiyat Island and inconsistent with what we understood to be happening on the ground for those workers. Moreover, they are wholly inconsistent with the level of compliance we know to be the norm for those working directly for NYU Abu Dhabi at our existing campus over the last five years in operational contracts covering services for food, safety, transportation, and all other matters. And, knowing that achieving new standards might prove to be challenging, a monitoring system was put in place to detect and fix non-compliance. No questions have been raised about compliance among the operational services — such as food,safety, and transportation — for which NYU contracts directly. The Saadiyat Island campus — on which construction is all but complete — was a ‘turnkey’ project that was built for us; contracts for building the campus were not under NYU’s direct jurisdiction, although all were subject to the same labor standards. Moreover, the safety and well-being of those working on our project must be a foremost concern in any discussion of labor. In this area, the record has been outstanding: On a four-year, 21 building, 4.8 million sq. ft., 38 acre project, involving 51 million person-hours of labor, the project had an accident frequency rate (AFR, the number of accidents per 100,000 person-hours) of .03; by contrast, the UK construction industry has an average of .55, and the AFR for the London Olympics development was .16. We will be working with our Abu Dhabi partners and Mott MacDonald, the compliance monitor for the project, to look into these reports, which are so at odds with the labor values we put in place. On a project this enormous, we expected that there would be instances when our standards were not met; our goal, for any worker who was not treated in accord with the standards we set for the project, has been to identify and correct those occurrences. And to any worker who was not treated in line with the standards we set and whose circumstances went undetected and unremedied, we offer our apologies. The occurrences cited in today’s New York Times are, if true as reported, troubling and unacceptable. They are out-of-line with the labor standards (here and here) we deliberately set for those constructing the ‘turn-key’ campus being built for us on Saadiyat Island and inconsistent with what we understood to be happening on the ground for those workers. Moreover, they are wholly inconsistent with the level of compliance we know to be the norm for those working directly for NYU Abu Dhabi at our existing campus over the last five years in operational contracts covering services for food, safety, transportation, and all other matters. We will be working with our Abu Dhabi partners to investigate these reports vigorously. When we first undertook the NYU Abu Dhabi project, the values of the NYU community as they related to those who would build and work on our campus were very much at the forefront of our thoughts. Where did that lead us? In addition, knowing that on any large project there are issues of non-compliance, with our partners we also set in place inspection, compliance, and enforcement mechanisms to ensure that the labor standards are met, and to address any shortcomings as soon as they were identified. Since the beginning of the project some four years ago, approximately 1,600 worker interviews have been conducted; nearly 300 payment-record inspections were made; and multiple site visits conducted to the Saadiyat Island construction site, the worker accommodation facilities, employers offices, and the residential facility for NYU Abu Dhabi students and employees, among others, all aimed at discovering and remedying instances when our labor standards were not met. To ensure that the standards were applied with utmost conscientiousness for the men and women working on contracts directly for NYU Abu Dhabi: With regards to those men and women working on assignments directly contracted to NYU Abu Dhabi – over 200 individuals in such operations as food, public safety, and transportation, where they interact with students, faculty, and staff daily — there have been no questions raised about compliance with the high standards we set. And, indeed, there has been a record of success: All of our directly contracted employees hold their own passports; over the past two years, 20 workers were reimbursed for employment agency fees; and the wages we pay are at the top of the market. Moreover, 97% of these workers were interviewed in the last year alone to ensure compliance with our standards. To make safety on the construction site a foremost priority: In any discussion about labor and any effort to set high standards for workers, the safety and well-being of workers must be a topmost concern. No one has questioned our safety record, which has generally been judged to be an extraordinary success. In spite of the enormous size of the undertaking — a four-year, 21 building, 4.8 million sq. ft., 38 acre project, involving 51 million person-hours of labor — the project had an accident frequency rate (AFR, the number of accidents per 100,000 person-hours) of .03, which contrasts very favorably with a UK construction industry average of .55, and an AFR for the London Olympics development of .16. And so we come to the issue of the application of the labor standards we set on the Saadiyat Island construction site, and the reports in the New York Times. Those cases are very much at odds with what we set out to do and what we understood to be happening on the site of the new campus. As an institution of higher learning, facts matter to our community; truth matters to us. Though construction on the campus is essentially over, we nonetheless want to know, if we can, whether these were anomalous exceptions – still not acceptable, but a confined phenomenon, perhaps a result of having small subcontractors on the job-site for short periods of time – or whether they represent something more widespread. As I noted, we are working with our Abu Dhabi partners to investigate these reports and seek more information on these cases to determine why, if the claims are accurate, they were not picked up by the compliance monitor, and to try to correct, to the extent still possible, any lapses in compliance. It is surely the case that the welfare and safety of the workers who built our campus – which we sought to elevate – should be our focus for the moment. Today’s story appears to have found non-compliant conditions which we missed, and which we must address. But I would also make the following observation: that today’s news, as troubling as it is and as demanding of attention as it is, should not come to represent the totality of how we think of NYU Abu Dhabi, because NYU Abu Dhabi is so much more. Against great odds, we have – through the hard work of many faculty, students, and administrators drawn to the idea of creating a unique, global university — forged an enormously successful liberal arts research university in Abu Dhabi. It is able to attract students worthy of winning top scholarships, able to recruit outstanding scholars to its ranks of tenured and tenure-track professorships, able to undertake meaningful research, and routinely able to persuade those who visit of its specialness and successfulness. As we approach the graduation of its first senior class, it is worth remembering that it is this community of scholars and teachers and learners that is truly at the heart of NYU Abu Dhabi. The University will be back in touch when we have more information to share on this matter.